Centsible Savings: New printable coupon: FREE Chex mix at Kroger this week! New printable coupon: FREE Chex mix at Kroger this week! Chex Mix is on sale for $1.00 this week at Kroger. 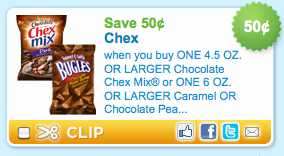 Print the TWO above $0.50/1 printable coupons to get 2 bags of Chex mix for FREE! Looks like the coupons are not available anymore.